I recently bought a new jacket, one of the safest I can get, but it offers no wind or thermal protection at all. I ride all year, and the last few weeks we have had frost in the mornings, I ride around 2 hours in the cold mornings, I was frozen solid with my new jacket, as the wind was blowing right to my skin. This stops about 95% of the wind, this coupled with an extra jumper means I am comfortable when the outside temp is 0 or below. I don't use the jumper if the temp is above 5 degrees, the jacket is more than enough, The zip small and a bit fliddley, not had any issues with it. The collar does fold down during use after a while, so it does not offer any protection to your neck. Bought it to serve as a mid layer under my RST textile jacket and when I am not on the bike I am using it as casual jacket. Tested it few weeks ago riding in Germany and Austria at 2 C.
The jacket does what it says, but the zip keeps parting company. Disappointed. The jacket was recommended by a mate and it came up trumps. Its wind proof and a wee bit tight on me but doubles as a casual top. I replaced my usual fleece mid layer with this & find it even more comfortable, with good collar material. I am a 42" chest and the large size is a good close fit allowing light clothing underneath. It has full length sleeves so no gaps & 2 generous pockets. Definitely warmer keeping wind chill at bay. very good, tested it the first day at the docks, very cool and windy day at the port. No wind coming through, kept me warm all day. Easy fit, I'm 178cm 95 kg xl size , brilliant jacket on the bike , under leathers very warm. Good quality, very effective and seems to be well made. 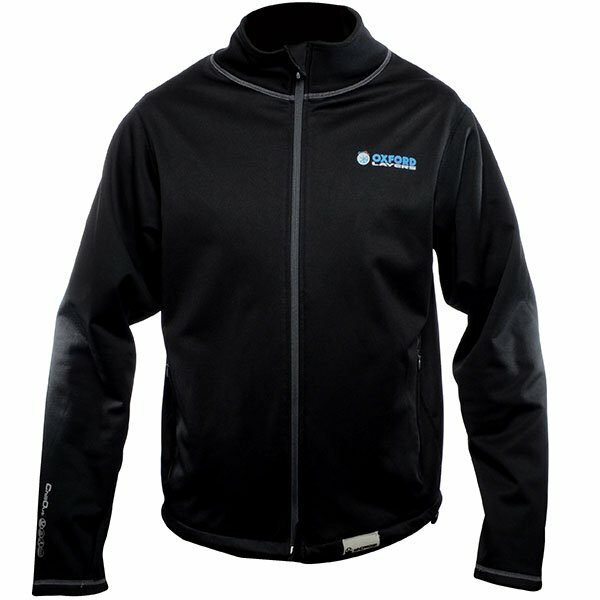 You can dispense with the thermal layer in your jacket as this really does provide excellent warmth and insulation. Looks OK when you take your jacket off too. Sizing seems spot on. I think it would be a good buy at circa £70, so for half that it really is a bit of a steal. Bargain @ over 50% discount. Really good quality product. Have only used it for walking around in yet, it's January and I'm waiting for the weather to pick up. It does keep the wind out and will save wearing two base layers. However I could not have justified paying the full price of £74.99. Get one while they are still on offer. As a stand alone jacket this is excellent and completely windproof and warm. Unfortunately I find it too bulky to wear under my Oxford Toledo Jacket when riding, which is what I bought it for, however I've decided to keep it as a stand alone jacket.. Warm thin jacket fits nicely under my textile jacket. Used this last week when skiing in. France -14c base layer this jacket and ski jacket was all I needed to keep warm. Oxford ChillOut provides an extremely effective mid-layer barrier against wind chill. Perfect for use with Oxford CoolDry and WarmDry base layers. Add to that the impact of rain at high speeds and it is easy to see how a rider's concentration could be adversely affected.The correct use of layering can dramatically reduce the effect of wind chill, as well as maintain comfort through the wicking of moisture away from the skin.The all-new ChillOut range of Oxford Layers uses the very latest in material technology to keep riders warm and comfortable in such extreme conditions. The key ChillOut material is water-resistant, windproof and breathable; it also has an insulating fleece lining, which is gentle on the skin. In addition stretch panels are employed in areas requiring maximum flexibility and breathability, so that comfort is not compromised in anyway. All Chillout Clothing is Unisex! Two-wheel transport can provide some of the most hostile environments the human body ever has to encounter. At 0 degrees Celsius, the wind chill factor at just 24mph is approximately -16 degrees Celsius. Add to that the impact of rain at high speeds and it's easy to see how a rider's concentration could be adversely affected. The ChillOut range uses the very latest in sportswear technology to keep riders warm when it's cold and cool when it's warm, helping them keep their concentration focused on the road rather than on their discomfort.